When it came to choosing a theme for my eldest son's recent 3rd birthday party, it took us quite a while to get a decision out of him! 3 year olds tend to change their minds a lot, and mine changes his about 7 times each day on what he likes and what he doesn't. When I first started to ask him what theme he wanted for his birthday (back in January, in an attempt to be organised!) he was adamant it had to be a minecraft - I was pretty perplexed by this, as to be honest I hadn't realised he even knew what minecraft was and it certainly wasn't something I'd ever heard him speak of before! After a few weeks, the answer started changing and he was asking for a superhero theme instead - I felt more comfortable with this as there are a lot more superhero themed products readily available, and more to the point - I knew that he WAS very into superheroes and was always watching them on TV or asking for superhero toys - so although he continued to chop and change his mind every other day (mentioning dinosaur parties, police man parties and all sorts of other things!) 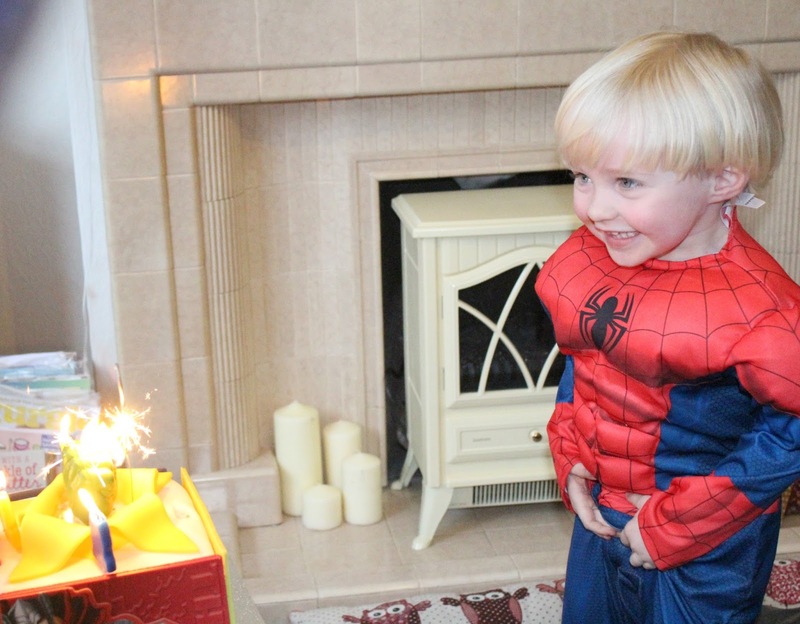 I decided to focus firmly on a superhero theme! 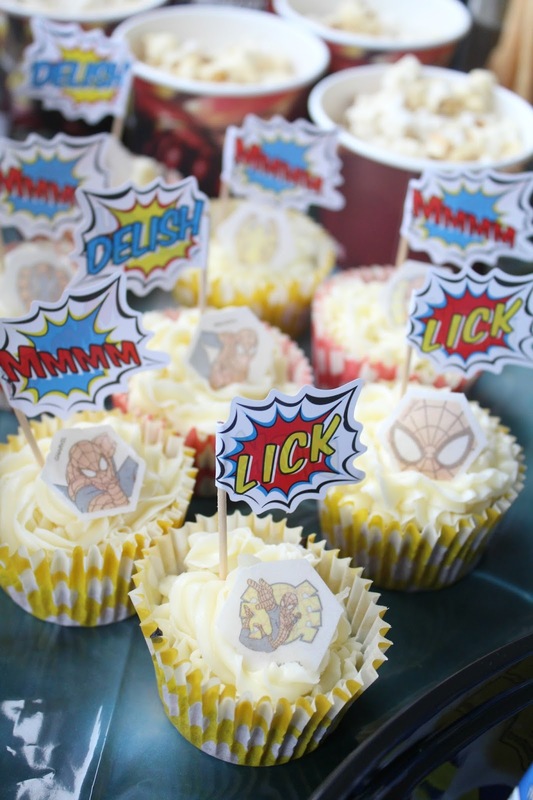 I headed straight for Pinterest of course and made a board dedicated to superhero themed birthdays - I found so many great ideas there for everything from food to games! The first thing I wanted to focus on was the cake - there were so many great ideas on Pinterest for superhero cakes, but I am a terrible baker and although I like to make the kids 1st birthday cakes I have no desire to make any past that! 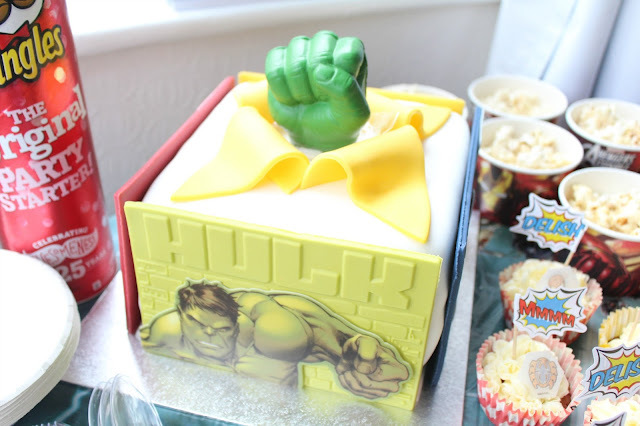 For his 2nd birthday I paid a local cake maker to create a cake for him, but this year I had seen a really great Avengers cake in Asda - I'm not usually a huge fan of supermarket cakes as they can be quite basic but this one was actually quite impressive! 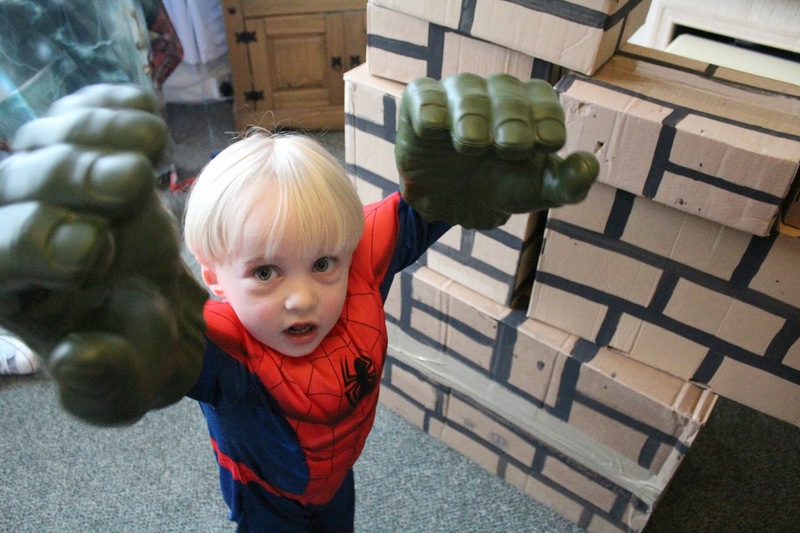 It was 3 layers deep, featured each of the avengers on the four sides, and had the Hulk fist smashing through the centre which I knew that Tyne would love - I thought it was a bargain at only £20! 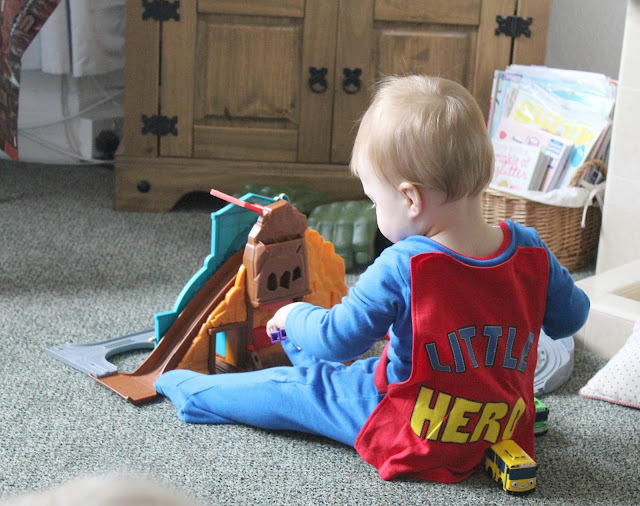 I also recommend Asda for picking up Superhero costumes if you want to dress to the theme - I got Tyne's Spiderman costume there along with Noah's superbaby suit and Sailor's bat baby romper - the babies suits were only £6 each! 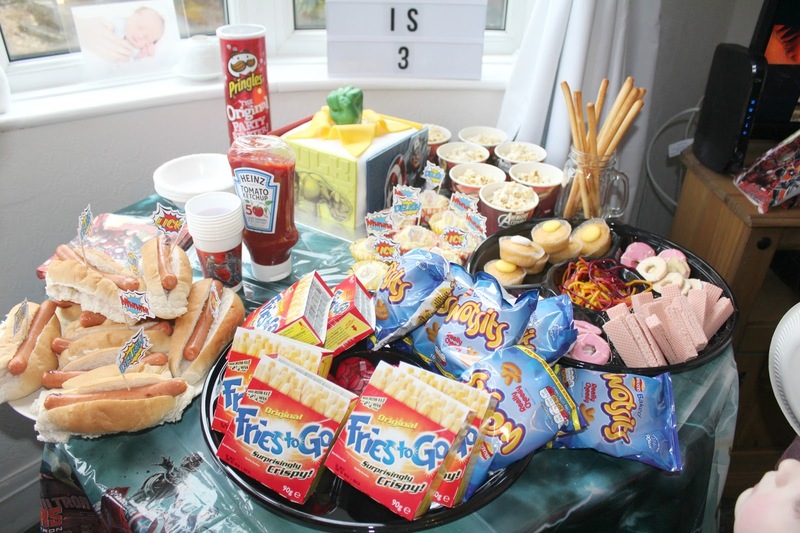 When it came to party food, I wanted to keep it simple and try to go with American style food - so we went for Hotdogs and fries. 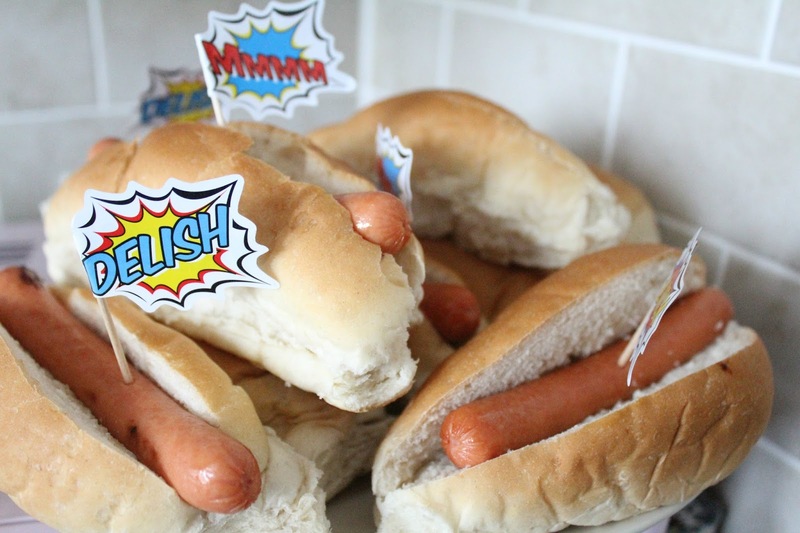 The hotdogs were super easy to cook and keep warm ready to be served and I jazzed them up a bit with some comic book pop art flags, & I used Fries to go as these were so easy to bung in the microwave and serve in the packets. 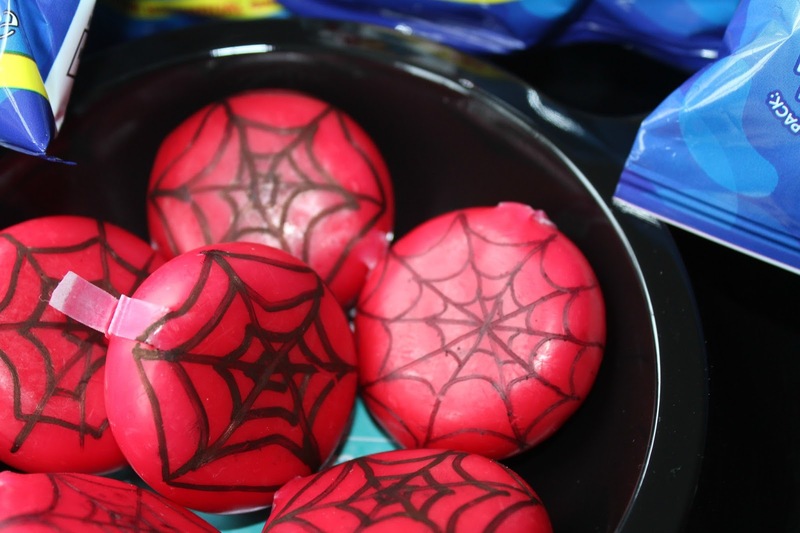 For the rest of the food I just did some tubs of popcorn, party biscuits, crisps, decorated some cupcakes with swirly icing and popped in some more comic art flags and spiderman edible decorations, and drew some spiderwebs on some babybel cheese! 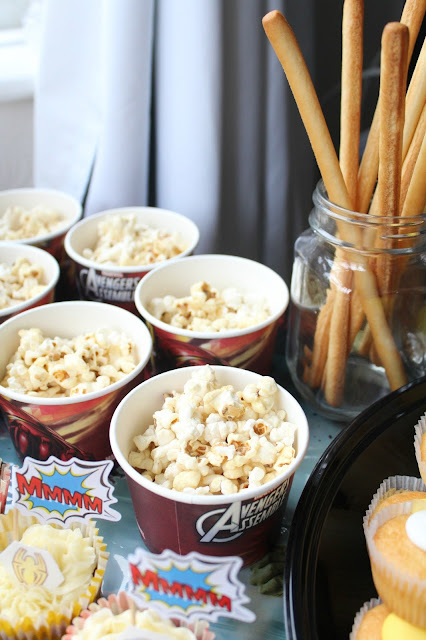 I bought all of the decor and tableware such as paper plates and napkins in an avengers theme from Party Bags & Supplies - the delivery was fast and quick, and the prices were far more reasonable than some other sites I looked at! I also purchased some takeaway boxes for left over foods and plain tableware for the grown ups from Inn Supplies. For games, I bought an Avengers themed version of "Pin The Tail" which I bought HERE. 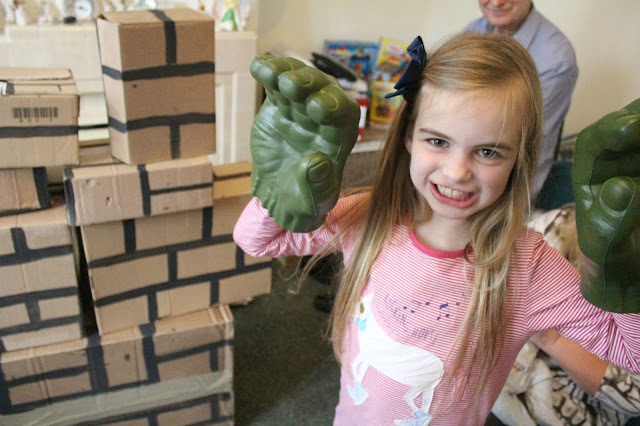 I also made a "wall" out of cardboard boxes with bricks drawn on, and had the kids take it in turn to put on the Hulk Fists that Tyne got for his birthday and try to knock down as much of the wall as they could with one punch - whoever knocked down the most boxes was the winner! This game proved to be very popular! We also had the usual traditional party games such as pass the parcel, musical bumps and a best dancer competition. I bought prizes such as Avengers sticker activity books from our local Home Bargain store and did them as a lucky dip which the winner of each game got to choose from. 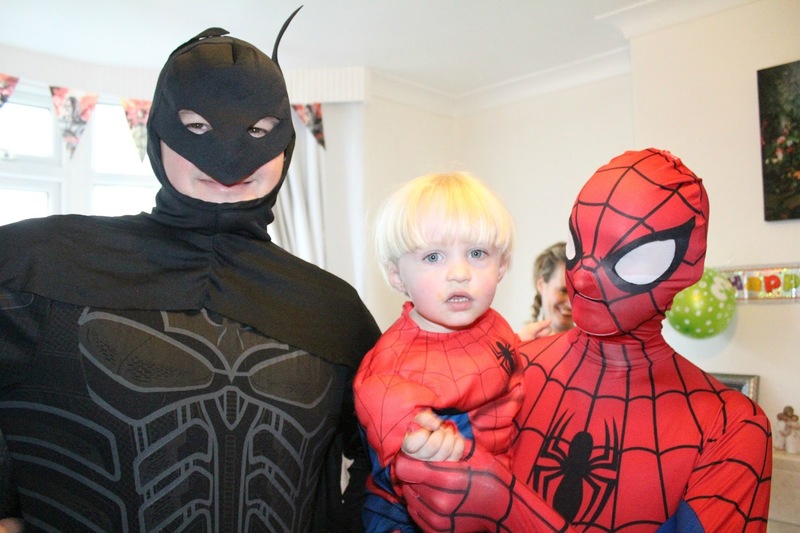 And for a final special touch, I decided it would be fun to have some special visitors arrive in the form of Spiderman and Batman! A lot of companies hire out actors to do Character Appearances at parties which is great for larger parties but these can cost upwards of £50 per appearance and we only wanted them to bring in the birthday cake and give some high 5's - The superhero costumes are available to purchase on ebay and many other online sites for a lot less than that, and if you have some willing family members to dress up in them then it can be a lot of fun - a character visit at a fraction of the cost! 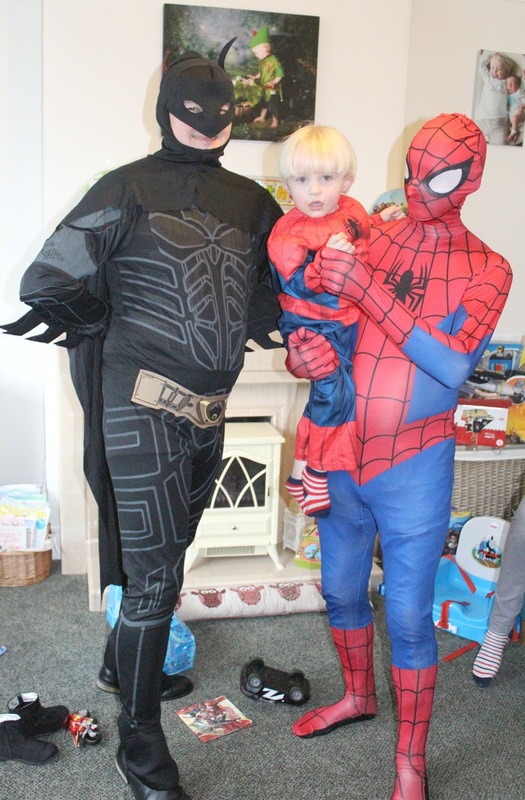 My Dad made a pretty good Spiderman and Jon didn't do too badly as Batman either!! 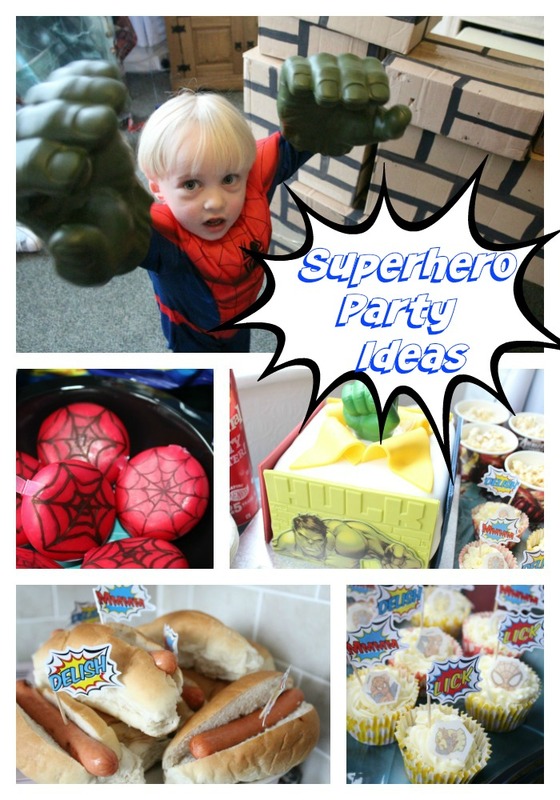 My little Superhero really enjoyed his day, I hope some of these ideas can be useful for you if you're planning a Superhero themed party too - be sure to have a look at my Pinterest board as there were plenty more ideas on there which I didn't use but were fantastic! Wow!! What a lovely birthday party. I am in love with the arrangements and planning to use few ideas for my nephew’s birthday party at venue New York. Your ideas are really best and liked by me. Thank you so much for sharing them here.